Home > Blog > Floods? Whatever next? The true cost of fossil fuel emissions, which has seen two centuries of meteoric advances in technology and living standards is now being counted in the billions that will be needed to build flood defences and relocate many thousands of people. Rising water levels, causing devastating floods are now occurring regularly in various regions throughout the world. This weekend, more than 80,000 emergency personnel including fire-fighters and soldiers were on duty, working to contain the most dramatic floods in Germany in a decade. Thousands of residents were still unable to return to their homes, and bridges and streets were impassable in many regions of eastern and southern Germany. Twenty people have already died in the floods across central Europe after several days of heavy rains. Thousands have been temporarily housed in emergency shelters waiting for the waters to recede so they can return to their homes. 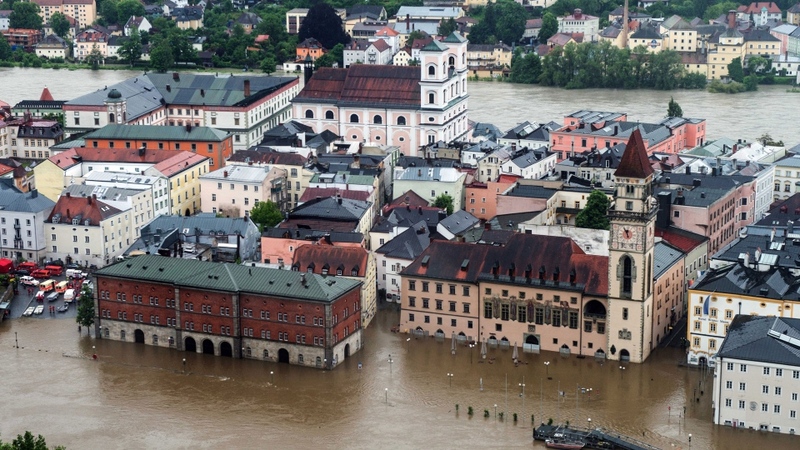 High water levels were also reported in Hungary, Slovakia and the Czech Republic, while thousands of people in Austria were busy shoveling away mud left by the receding flood-waters of the Danube. In Hungary, around 2,000 residents of the town of Gyorujfalu north west of Budapest were evacuated because authorities were afraid the levees would not withstand the pressure of the Danube’s waters. The rising waters of the Danube, Europe’s biggest river, were expected to reach Budapest on Monday, inching close up to the top of the river’s flood fences, which are 30.5 feet (9.3m) tall. In one of the most devastating floods, in 1838, the Danube killed 150 people and left over 50,000 homeless. Similar and worse catastrophic floods have been suffered in China, Mexico, India, Australia, Chile, the U.S. and the list goes on. Predictions for the future are grim. Things are only going to get worse – or are they? In 1894, the Times of London estimated that by 1950 every street in the city of London would be buried nine feet deep in horse manure. In 1894 they could not have envisaged the birth of the motor car. The Iter project is the biggest scientific collaboration ever. Using nuclear fusion, the project aims to recreate the process at the centre of the sun, converting hydrogen to helium with a method quite literally as old as the stars. The 34 nation collaboration, representing half of the world’s population, are seeking to create and produce a clean, cheap energy source for the planet and reduce the quantity of greenhouse gasses in the atmosphere. Should this happen, it is predicted by some that the Earth would begin to cool again. Staying with the Sun, some astronomers believe that the Sun’s natural cycles of sunspots and solar storms, point to a period of extreme cold or a ‘mini ice-age’ similar to the one experienced in the 300 years between 1400-1700. If the ice-caps re-freeze and consequently, the water levels fall, maybe flooding would be avoided, but in 1400 there were 350m people in the world. Would we have enough fresh water for the 8bn people of today, or would ‘Water-wars’ ensue and water become as sought after as oil is today? And with all the cheap, clean fuel and the medical advances expected in the coming decades, how long before we are 20bn? Or 50bn? And won’t that present a whole raft of new challenges? The floods are real and their consequences are dire. Their causes can be explained but using that evidence to forecast the prevailing predicaments of the future is not such an exact science.